I had some puff pastry and pork tenderloin in my freezer that I wanted to use up. I was trying to come up with a recipe using the pastry and the meat. What came to mind was Beef Wellington. 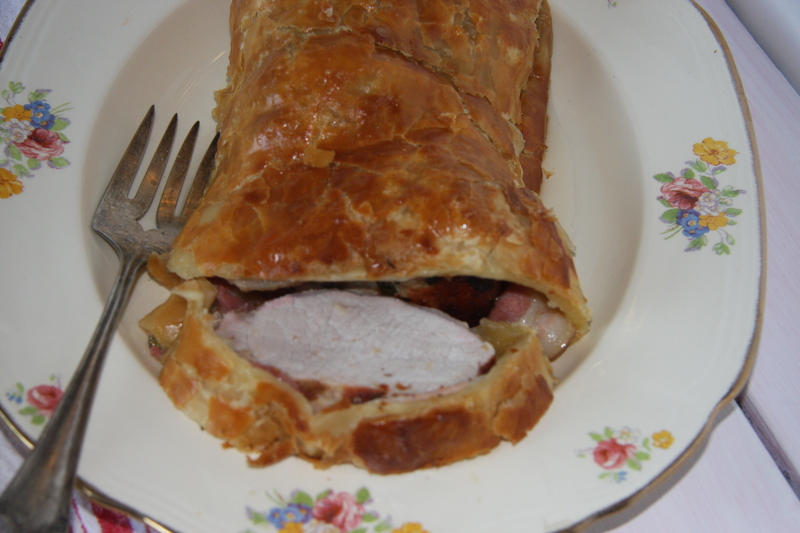 If beef could be wrapped in pastry, why couldn’t pork tenderloin? The lights went off. I was going to somehow wrap my pork tenderloin. There are times and they are happening much to often, that I get cooks block. What is that, you ask? Well, think of writers block. When a writer can’t come up with new ideas and concepts. Cooks block is when a cook can’t come up with new ideas and concepts for meals. 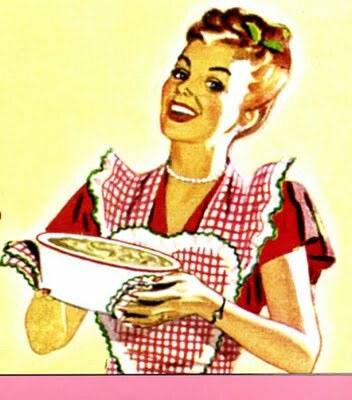 Not so great when you have to prepare meals 3 times a day, seven days a week. But somehow we manage to struggle through it all. Even at times when the meals start to repeat themselves. I think that if someone is not happy with a meal, they should give it a go and prepare something to please a hungry crowd. Soon to discover it’s not so easy. Anyway, here’s what I came up with. 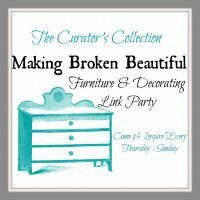 Hope it appeals to you. Take a pork loin cut it in half. 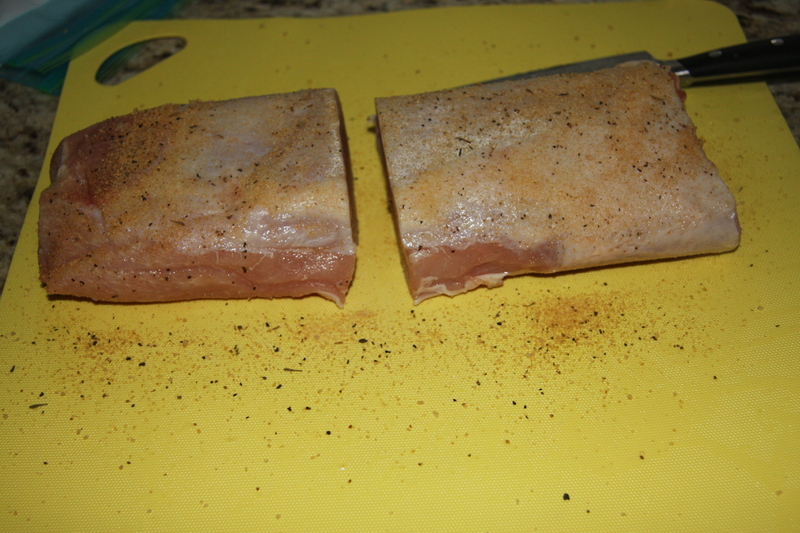 Pork loin, salt, pepper to taste, 1/4 cup of red wine, couple of glugs of olive oil and 1 minced garlic clove or 2 tsp. of granulated garlic in each bag, allowing it to marinade in the fridge for a couple of hours. Remove and pat dry. Next fry the outside of the tenderloin, enough just to brown. 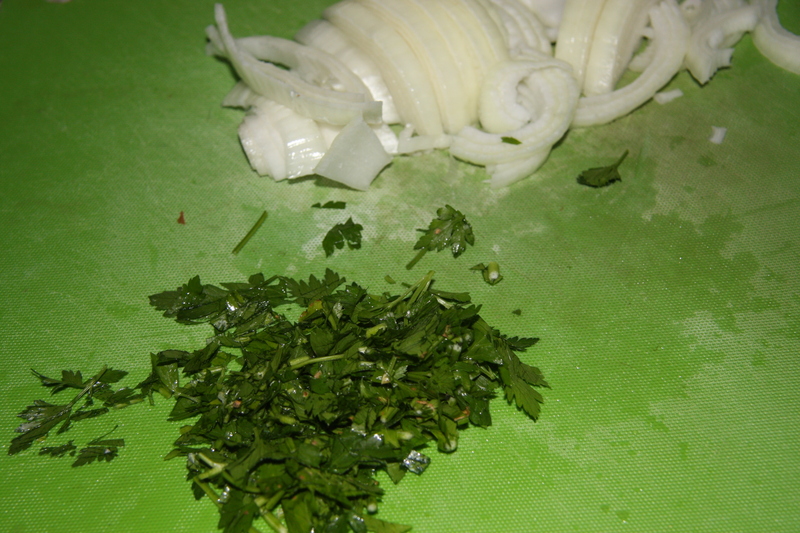 Take and mix grated mozzarella, bread crumbs a little oil and some more chopped parsley , roll the meat in it. 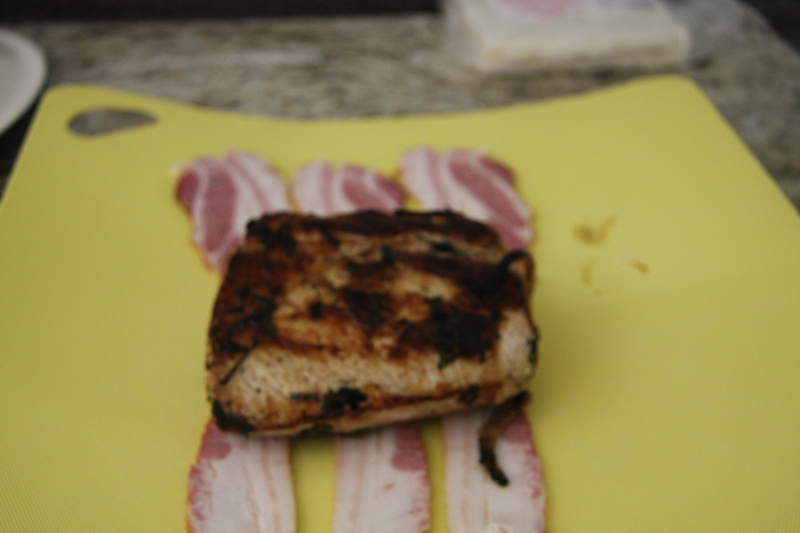 Take the bacon strips and wrap them around the marinaded tenderloin. Set aside. 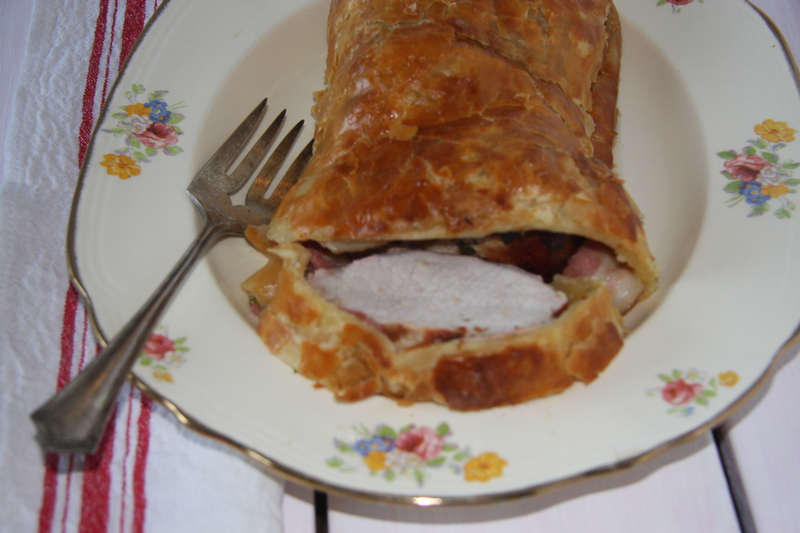 Place one tenderloin, I changed my mind and decided to place both pork tenderloin pieces in one sheet of puff pastry. On the edges of the puff pastry and take a beaten egg and moisten the edges all the way around. Cover the meat with the pastry at one end and start to roll. Wrap the meat up and seal the edges. Then tuck them under. Brush pastry with egg wash. Place on foil lined pan and bake for 350 for 40-60 minutes. I always check mine with a meat thermometer. If the pastry starts to darken, cover with foil and turn down the temperature to 325 – 330 degrees and bake a bit longer. You can test the meat with a meat thermometer to be absolutely sure it is done. 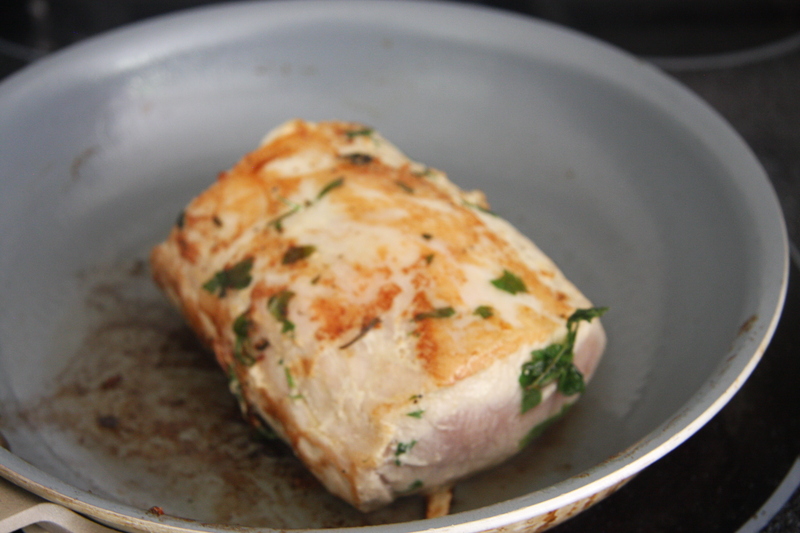 Cut pork tenderloin in half, if puff pastry is in two sheets. 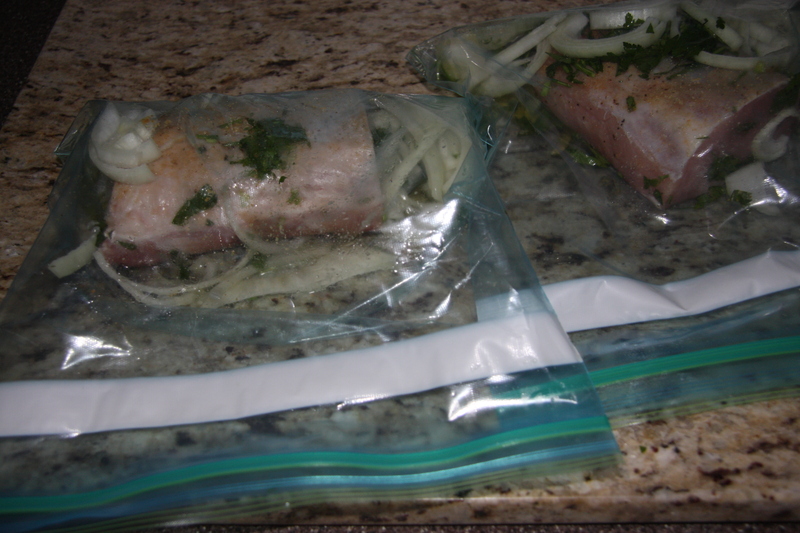 Place into two zip lock bags and put in olive oil, parsley, onion, garlic and wine for at least 2 hours. Remove and pat dry. Heat a pan with olive oil and fry tenderloin to brown. 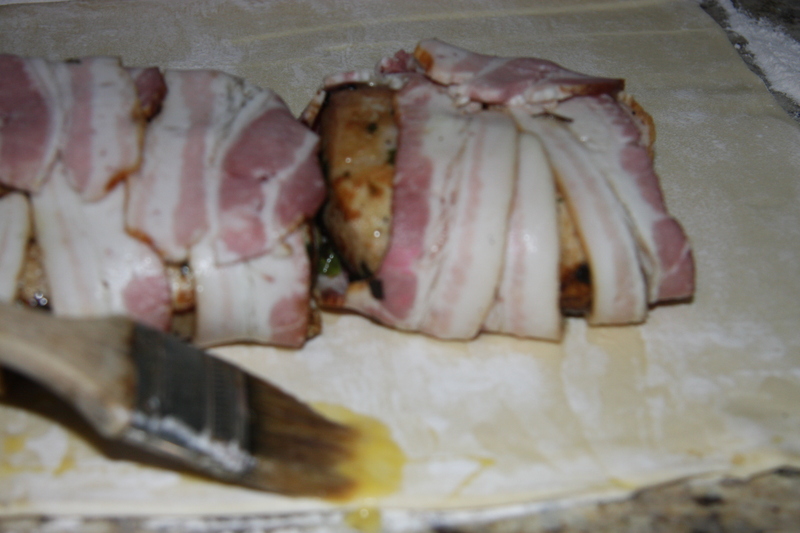 Wrap in strips of bacon and place onto puff pastry which has been rolled out. 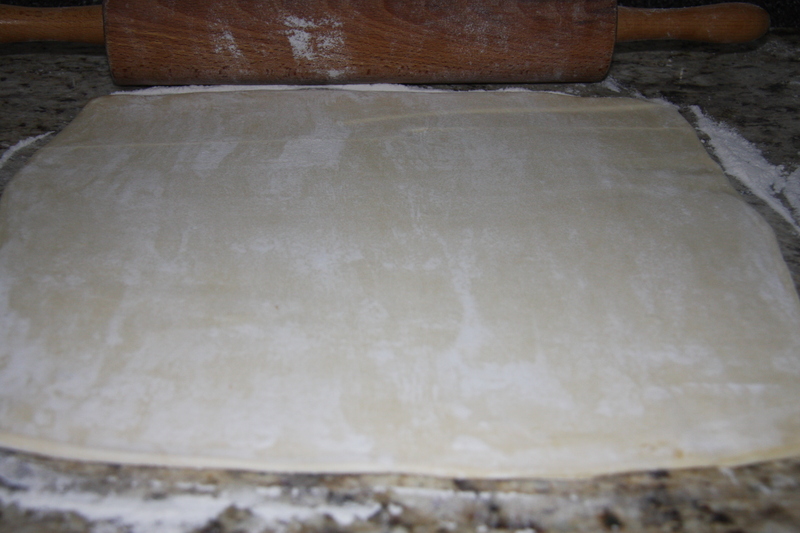 Brush edges of pastry with beaten egg and roll up pressing edges. Place onto a foil lined pan and brush the pastry all over with the beaten egg. Bake into a 350 degree oven for 40-60 minutes. Check tenderloin with a meat thermometer to be more accurate. 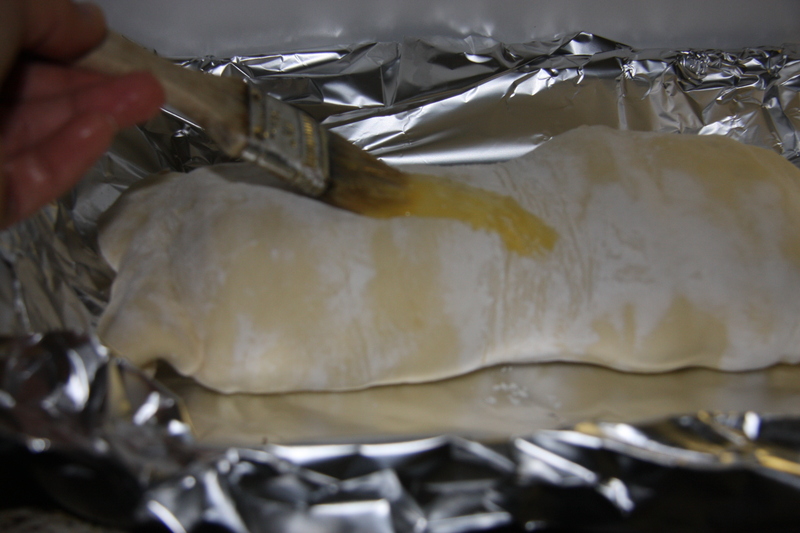 If pastry starts to turn very dark, cover with foil and turn down oven temperature.